We were honored to have this sister duo attend our Event at Quicken Loans Arena, and even more thrilled to learn how uplifting and inspiring their experience was. Guest Blogger: Clever in Cleveland, "Showing up"
I started feeling a shift a few years ago when I started seriously practicing yoga at Inner Bliss Yoga Studio. My roots are grounded and buried deep within this illustrious city. 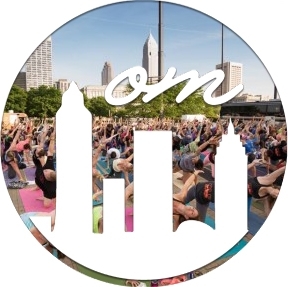 Yoga Rocks the Park, an outdoor yoga series featuring the unique dimension of live music during the practice, is a program that was brought to Cleveland by Andy Holland and Emily Miller in June 2012. These yogis represent the power of the collective and a spirit of Oneness! If you're wondering what that delicious elixir used by the teaching assistants at our yoga events is all about, here's your answer! Our friends at Nooma have developed a yummy hydration beverage that represents more than just a drink. Wondering where all the clever logos and designs for our yoga events come from? We'll share our secret! Believe in CLE yogi Marilyn Sadler in the News! Proud Believer in Cleveland, Inner Bliss yogi and children's book author and creator Marilyn Sadler was featured in the Plain Dealer on Sunday, September 14, 2014. We are all going through something and we can all come together to overcome anything, as well as to celebrate everything. View the entire gallery of photos of Event #4 at the Rock Hall courtesy of New Image Photography.